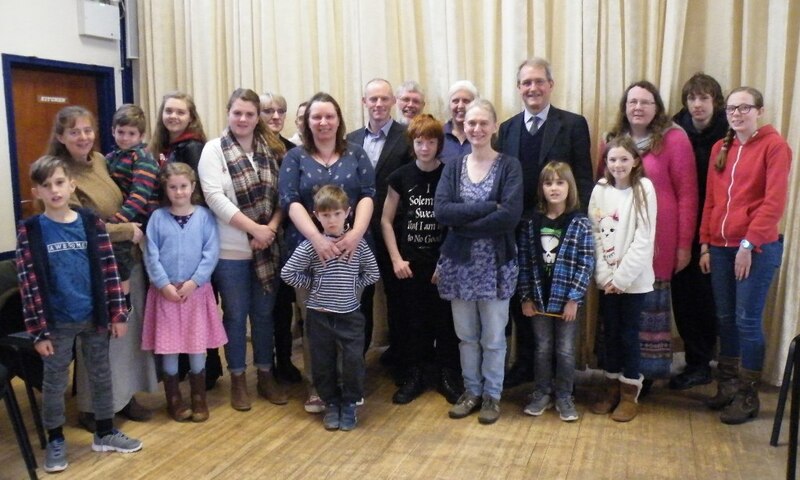 Eight home educating families attended a meeting with North Shropsshire MP Owen Paterson on 23rd Nov 2018. 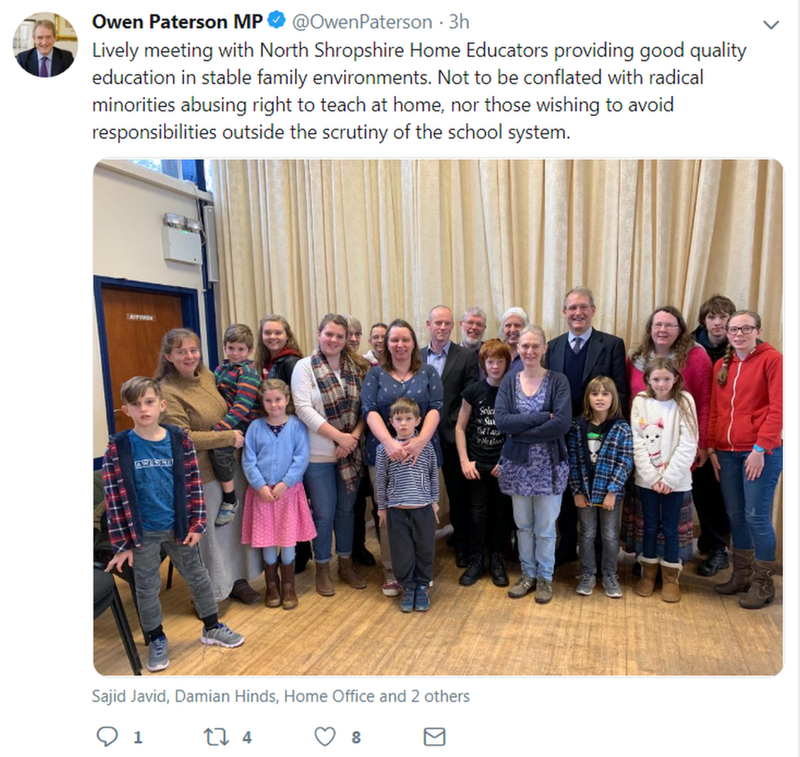 This had been organised in order for constituents to raise questions with their MP and jointly express their concerns about negative allusions and direction of travel re home education in government and the media, and the resulting negative perception of HE in the minds of the general public. Concerns that the DfE were conflating education issues with welfare issues. There was an accompanying failure to respect the boundaries of parental responsibility for their children’s education. LAs are very keen to identify local HE families and carry out their checks, but offer no help at all with the provision of exam centres – these are increasingly proving very difficult to access within Shropshire. The recent Consultation and Call for Evidence had been excessively long, over-complicated, technically inaccurate in places and generally unfit for purpose for busy HE parents. Concerns about the expanded remit of Ofsted and its perception that anything unregulated (by them) was automatically suspect. Many HE parents see the education of their children as an extension of their parenting, hence find registration totally inappropriate. Mr Paterson was asked for his understanding of a parliamentary written question from 15 Nov answered by Anne Milton of the DfE. Did this indicate that the DfE actually had no current evidence that HE may present increased risk to safeguarding and of radicalisation? Link to: Written question – 191969 – UK Parliament. Mr Paterson was already aware of the huge amount of time, effort and expense demanded by HE and expressed support for what HE families are doing. You can write to him at Rt Hon Owen Paterson MP, House of Commons, London, SW1A 0AA, or via his website. There was little he could do about negative media reporting, but he was happy to hear of any departmental or ministerial inaccuracies (e.g. instances from the recent Consultation and Call for Evidence) and would pass this on to the appropriate Dept. He advised parents to emphasise the positive outcomes of their home education. He urged them to take up any local issues with their local councillor and Local Authority, and was assured that this had already been done. He was sympathetic to the problem of accessing local exam centres, and seemed willing to press for more provision in this regard. He could see it was unfortunate that the HE community had got swept up into the general concerns about dangers of radicalisation and abuse, but advised that it was not productive just to rail at the injustice of this. In government circles, these things are perceived as real dangers. Circumstances have changed and one has to accept the situation as it is now, providing evidence of positive outcomes of HE, of wrong application of legislation etc. and also suggesting ways in which the State could come up with a regime which is benign towards home educators, but at the same time filters out the dangerous elements. He thought the answer to the Written Question suggested that at the time of the Consultation, the DfE had no evidence of either abuse or radicalisation. He saw some great individuals within the HE community, but urged them to work more collaboratively to defend their cause if they feel assaulted by excessive legislative pressure or negative stereotyping. If opposition is coming from official bodies or quangos, he suggested that establishing a national body could be one way of raising a positive profile for HE, defending its cause and countering some of the negative claims. After the meeting Mr Paterson posted a picture and comment on Twitter. This entry was posted on 23/11/2018 at 9:41 pm and is filed under Home Education UK. You can subscribe via RSS 2.0 feed to this post's comments. Responses are currently closed, but you can comment below, or link to this permanent URL from your own site.